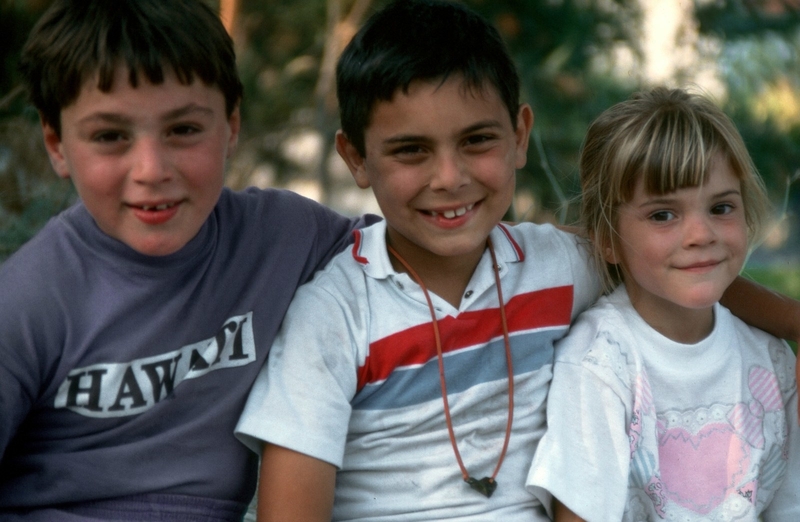 In Palestine, we could so easily have been treated as the enemy, but we were welcomed like family. 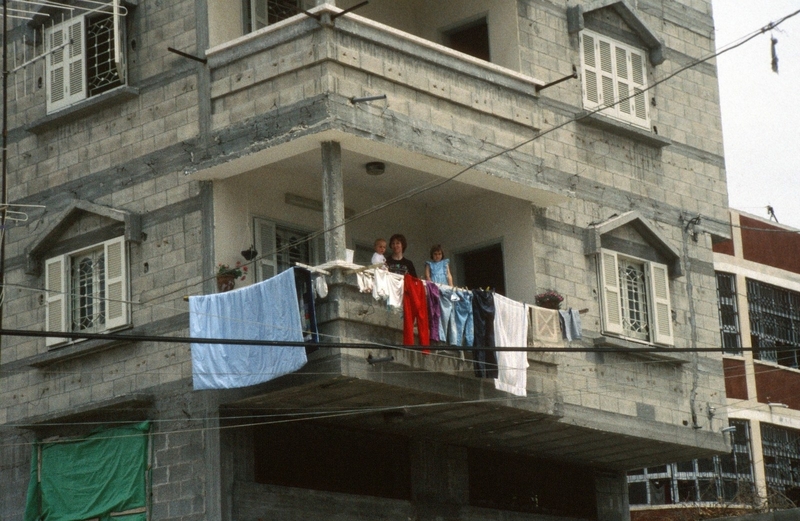 The author and her family with neighbors on the roof of their apartment in Gaza, 1993. Around three years into my family’s time in Gaza, there was a knock on the door early one morning: Our landlady, Auntie Faidha, was standing there with a big smile, holding a fresh bowl of ful mdammas. My sisters and I turned up our noses at first, because the dish looks like chocolate pudding but is actually a thick, tangy stew of dried fava beans, in this case topped with hard-boiled egg, tomato, and parsley. I'm glad my mom made us finish our servings, though, because just one plate in, you become an addict. 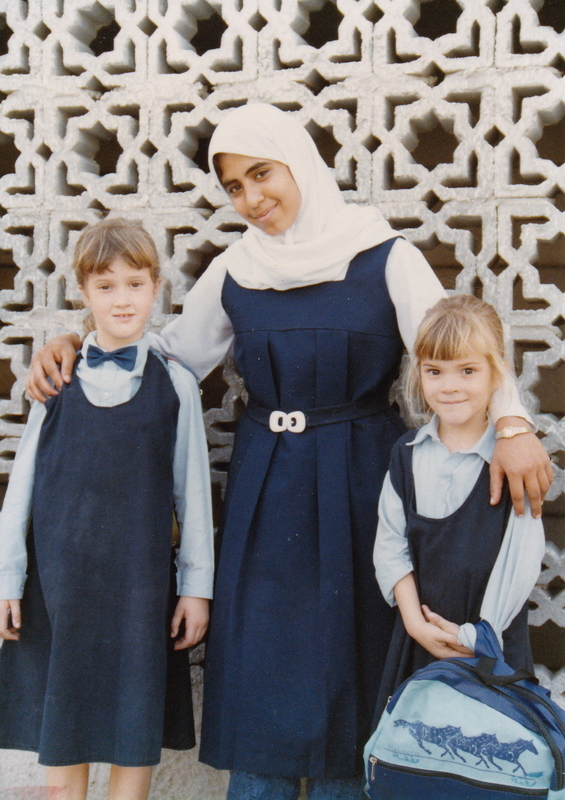 In 1989, when I was five, my parents moved with their three little girls from Texas to Palestine. My dad, a biochemist, took a position teaching at the Baptist School of Allied Health Sciences in Gaza, and we lived there for five years. And my experience growing up as an American in Palestine — as representatives of a government that backed Israel, which in turn occupied the Palestinians’ land and oppressed their people — has forever shaped the way I see my own country’s responsibility to refugees. I’ve thought hard about this, not only in the week since President Trump signed an executive order putting the US refugee program on hold and suspending resettlements from Syria indefinitely, but as the Syrian refugee crisis has grown increasingly urgent in recent years. And I know that some Americans are sincerely concerned about the risk they imagine those refugees might pose to their communities, however unfounded. But in my own life, regardless of the policies and logistics at play, I don't believe it's an option not to extend hospitality to foreigners, personal risk or hardship (real or imagined) notwithstanding. And that is because of the way my own family was received when I was a child. In Gaza, we could so easily have been treated as the enemy. Instead, we were welcomed like family. It was well-known in Gaza that the US provided extensive funding, training, and allied support for Israel's military, which ran every aspect of daily life at the time. Soldiers patrolled on foot, in jeeps and armored vehicles, with carte blanche to detain anyone, for seemingly any reason. The Israeli Defense Forces controlled the electrical grid, and Gaza's power was regularly switched off, leaving people in the dark and food spoiling in refrigerators. Every night, it was illegal to be outside your home after 8 p.m. At any time, the army could impose a “strike,” which temporarily forbade the use of vehicles, or a general curfew, which meant everyone had to stay inside for hours, days, or weeks. My family and I arrived as citizens of the nation that robustly defended and advocated for the Israeli occupation, and our Palestinian neighbors knew this. The biggest potential concern was that we could be spies — informants for the US or Israel, there to collaborate with the Israeli military. Since the homes of known or suspected militants were routinely destroyed, the community’s unease was understandable. The welcome sign when entering Gaza from Israel, circa 1989-1995. That our neighbors still chose to get to know us for “the content of our character,” to quote Dr. King, is remarkable and humbling. They didn't do so because they were naive or ignorant. They did it with their eyes wide open. I know without a doubt that people had to do a lot of soul-searching, muster a lot of bravery, and have a lot of hard conversations with one another about whether it was worth the risk to extend their hospitality to us. But all of this happened out of our view. We were welcomed and provided for, taught the language and how to cook, visited and hosted and shared with, with such dedication that you would think no one counted the cost. During one of those weeklong curfews, our elderly neighbor called to us over the wall between our houses. When we came close, she handed us a steaming plate of waraq dawali (stuffed grape leaves), which to this day are the best ones I have ever eaten. My big sister and I studied in Arabic at a Roman Catholic school, Monday through Thursday and Saturday, to accommodate both Muslim and Christian holy days. As a family, we spent most of our time visiting and being visited, which in Palestinian culture has a whole ritual to it, with different sweet and savory treats and beverages served in a specific order. My sisters and I ran around in the street with the neighbor kids, constantly in and out of each other's homes, making up games, playing tag and riding bikes, and teasing each other mercilessly with our favorite insult: “Ya hmar!” (“You donkey!”). The author with a playmate from the neighborhood; on her first day of school in 1990; with her sister and a friend at the end of a school day. We tried to maintain an edge in the seriously competitive food-sharing culture already familiar to American Midwesterners (although we mostly cooked the Palestinian recipes we had learned) — giving dishes of homemade food to neighbors and friends, and also returning the dish of whoever had made something for you, refilled with a tasty treat. In retrospect, I don’t know how my mom ever kept straight whose dish was whose. If you let your guard down for even a day, it seemed, you'd get swamped and never catch up. But we did our best. My parents learned to be very aware of how they presented themselves, so that they didn't give anyone greater cause for alarm. They never wore sunglasses, because that was what spies might do. And they noticed that when they met new people, the conversation almost always began with politics, as a way for Palestinians to read between the lines and gauge whether this American couple posed a threat. My parents learned to steer conversations early on to relatable themes, showing interest in people's families, asking about their kids, holidays, and food — and making a point not to engage in political talk. That is not to say that my parents never encountered challenges. Sometimes an acquaintance would speak out in anger, expressing doubts about their motives or blaming them for the hardships facing Palestinians. In those moments, my parents' word was only so good. It was our friends — those who had chosen to trust us and get to know us — who advocated for us and eased the tension. We celebrated our first Christmas in Palestine after we had been there for only four months, and my parents were desperately homesick. It is very hard to be a foreigner during the holidays, and was even harder in the days before email and Skype. We had hardly been in Gaza long enough to make deep friendships, but our neighbors knew that holidays were meant to be shared. On Christmas morning, the teenage boys down the street cut pine branches to decorate our front gate, and interspersed them with red and white carnations. It was not even their holiday, but they knew it was ours. When my little sister was born in Gaza, in 1991, my mom's lady friends gave her all sorts of tips on how to get that bald baby's hair to grow, to no avail. It finally came in when she was nearly 2, possibly thanks to all those olive oil head massages she'd received as an infant. The women commiserated (lovingly) about their troublesome children, imagined which kids from each family would grow up to marry one another, and contemplated each other as possible in-laws. While everyone knew that we would probably return to the US at some point, it was comforting to share those daydreams. It made us feel that even for just a few years, this place could truly be our home. 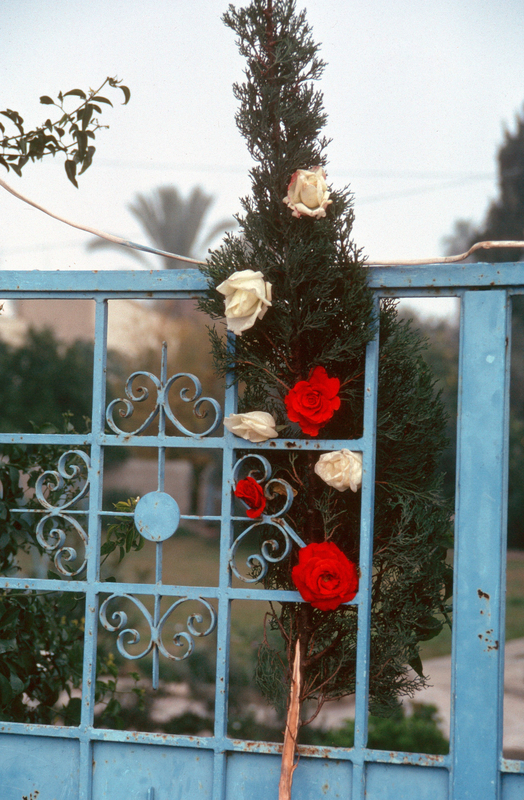 The author's mother and two younger sisters on the balcony of their Gaza apartment, 1993; the family's gate, decorated by their neighbors for Christmas, 1989; the author and her sister getting homework help from their parents' colleague, 1990. It doesn't make you a bad person to worry about your family's safety or the safety of your nation. It makes you human. But I would ask anyone who feels fear when you think about refugees or immigrants, especially if they are of a different race or religion from you, to ask yourself where that fear truly comes from, and whether it’s justified. And to try, even if it's difficult, to come to a place of generosity and grace while holding that fear. Growing up, I saw people who had every reason to be suspicious of my family extend that gift to us. And my debt of generosity is so deep that I won't settle it in my lifetime. Americans tend to see ourselves in the role of givers, not receivers, when it comes to this kind of generosity. Our country has more freedom, more money, and more space than most in the world — not to mention a history of imperialism and a tendency to see ourselves as saviors. It’s our choice to open the door to refugees and immigrants, or close it. In the current situation, we have the capacity to help those fleeing wars and persecution in Syria and other parts of the world. And as a nation, we have been given — and have taken — so much already that I believe we have an obligation to do so. Especially when there’s no evidence that the “others” currently in question actually do pose any threat, and when they have already passed incredibly exhaustive background checks. 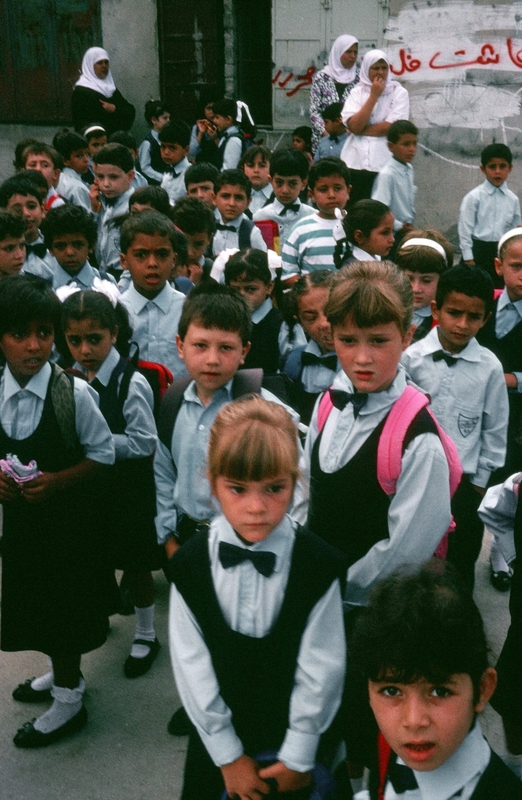 My family hadn’t, and our neighbors in Gaza still took a chance on us. Every American should take the time to familiarize themselves with the (already excruciatingly thorough) screening process for refugees seeking to enter the United States, and should know that none of the people responsible for the terrorist attacks President Trump used to justify his travel ban came from the seven countries it targets. But the bottom line is that I'm OK with the idea that despite the most rigorous possible vetting — and the fact that the odds of being killed by an immigrant terrorist are 1 in 3.6 billion — we can't prove that no refugee will ever do anything to harm any American. My family also could not be proved to be totally innocuous to our neighbors in Gaza. I'm pretty comfortable saying we didn’t harm any Palestinians' lives while we were there, but they couldn’t have guaranteed that we wouldn’t. The people who ask this question — the estimated 36% of Americans who support indefinitely halting our Syrian refugee program — seem to presume that you’d be crazy to open your doors to foreigners fleeing dangerous places. But many Americans are doing it already, and have been for decades, through a variety of faith-based and secular refugee resettlement groups. The year my husband and I were married, we hosted a couple from Afghanistan and their toddler daughter in our two-bedroom house, through World Relief in Sacramento. Honestly, it was not purely a warm fuzzy experience, and it was stressful in many ways — ways similar to what I felt again two years ago, when I brought my newborn son home. The strain of feeling responsible for people so vulnerable and out of their comfort zone was intense. Our refugee guests were well-educated and at least middle class, which may have left them better prepared to start over in a new place. But they were visibly shaken and clearly uncomfortable with how much they had to depend on others, having left good jobs and a comfortable home behind. They lived with us for nearly a month, as they awaited and then received documents that allowed them to work. We helped them find an apartment near the local mosque, and some of our Afghani friends made the time to come over and chat with them in Dari when they were able. We tried to help them get to know the city, taking them to the rose gardens, helping them run errands, getting them a bicycle. They were kind and almost too reluctant to ask for help, and cooked for us most of the time that they were with us. To our dismay, we later learned that it was partly because they really didn't like our cooking. But I’m sure they also did this because cooking a meal for your family and sharing it with others makes life feel a little more humane. We haven’t had the opportunity to open our home in the same way since moving to a much smaller apartment in New York. But I know that when space permits, we will welcome refugees again, no matter where they come from — because I, at least, have no other option. As told to Susie Armitage. Contact Rebecca Peterson Zeccola at susie.armitage+RebeccaPetersonZeccola@buzzfeed.com.